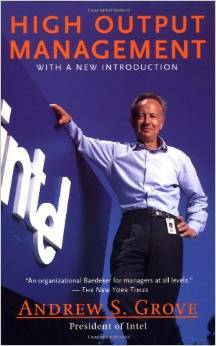 I am such an admirer of Robert Noyce and the company he built, Intel. Gordon Moore also. I viewed Grove as a grouchy old curmudgeon and never paid too much attention to his perspective because of his temperament. Boy, was I missing out. I have new found respect for Mr Grove. I purchased this after reading Ben Horowitz’s book, “The Hard Thing About Hard Things.’ In which Mr Horowitz calls this one of best management book ever written. This book reads like a textbook. There is ZERO fluff in it. I believe that would accurately describe Andy Grove, all substance and no fluff. Mr Grove is so smart and thorough and topics covered so dense that it took me a few times reading certain parts to fully understand the concepts. I also like the fact he wrote this book for middle managers. This is not a nebulous book on “Leadership”. I can’t recommend this book enough. I have purchased many copies and i hand them out to friends of mine who I believe will read and put into practice the advice from this seminal work. Identify half a dozen new indicators for your group’s output. they should measure both quality and quantity of the output. 10 Points. Have your subordinates do the same for themselves, after a thorough discussion of the set generated above. 20 Points. Evaluate your own motivation state in terms of the Maslow hierarchy. Do the same for each of your subordinates. 10 Points. List the various forms of task-relevant feedback your subordinates receive. How well can they gauge their progress through them? Redo one of these reviews as it should have been done. 10 Points.